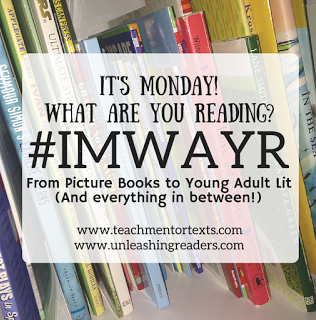 A huge thanks to Jen at Teach Mentor Texts and Kellee at Unleashing Readers for hosting us for the kid lit and YA version of #IMWAYR!! 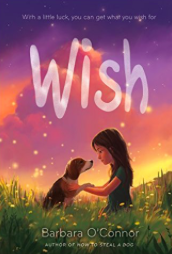 Wish is the story of Charlie, a girl that is thrust into situations she didn't want - her dad is in jail and her mom won't take care of her. It becomes so bad that social workers become involved and take Charlie from her home in Raleigh to the small town of Colby, North Carolina, in the Blue Ridge Mountains to live with her aunt and uncle. The storyline captivates, but for me what Barbara O'Connor does in this book with characters, setting, language, and insight into humanity are the real reasons this book is such a delight. When Charlie gets to Colby to live with her aunt and uncle what she sees are "... the sorry sights of Colby. A gas station. A trailer park. A laundromat." And at her neighbor's house what she noticed - "Next to the front door was a ratty-looking couch covered with a bedspread. Wilted yellowing plants and dried-up flowers planted in coffee cans lined the edges of the porch." Charlie considers all the people in Colby beneath her, nothing more than hillbillies. Sights like these just support her thinking. As Charlie's time in Colby continues, she comes to see these same things in a different light. The subtle language shifts about the environments and settings through Charlie's eyes is truly masterful. It reminds me a little of the saying about not judging someone until you've walked a mile in their shoes. 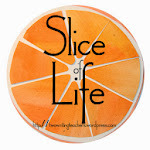 Charlie began the judging game early on, and had a hard time letting go of being judgmental because letting go might make her see Raleigh and her "home" life more clearly. But when she does let go of that judgment, her eyes see her surroundings differently. The simplicity of the book tugged at my heart as well, bringing back so many fond childhood memories, and not one having to do with being glued to a screen of some sort. Designing fort plans, gathering materials for the fort, riding bikes everywhere, working crossword puzzles, playing games, selling things from the end of the driveway, learning to crochet, going fishing. The list goes on and on, but this book really celebrates those small moments of childhood pleasure. In that way, Wish reminds me a bit of The Small Adventure of Popeye and Elvis, and why I love that book so much. The simplicity of life is celebrated. And then, there is the title of the book. Wish is an apt name as Charlie makes it her job each and every day to make a wish (and the same one each time). It reminded me again of my childhood, and how we got to make our wishes - seeing a white horse, getting the long part of a chicken wishbone, first star of the night. I wasn't as persistent as Charlie with my wishes, but I did love having the opportunity to make a wish. I would love to know how Barbara O'Connor came up with all the different ways Charlie got to make her wishes. I tried to tally the different ways, and had to give up because counting was getting in the way of the story. But I do know she's listed at least 30 (at my last count before giving up) different ways of wishing. What a delightful thread to weave throughout the story! I could go on and on about the language I love in this book, but I am going to focus on just three things that really stuck with me - one phrase and two words. When Charlie first meets her neighbor, Howard, at school, she noticed he had an "up down" walk. That phrase comes back multiple times in the story. Two such simple words, but put together, quite descriptive. One of the other words I enjoyed was "Scrappy", her dad's nickname because he gets in so many fights, landing him in jail eventually. It's a great word for an unfortunate circumstance. And then there is the word "pineapple." Charlie is a bit of a hothead also, so Howard tries to convince her to say "pineapple" when she gets upset instead of lashing out physically or with other inappropriate/unkind words. I chuckled at how many times Charlie tried to make "pineapple" work for her, not always with the greatest of success. And we can't forget Wishbone, the name of the dog that also connects with the title. Without giving too much of the story away, I will say that as humans, we all need someone to love us unconditionally. That is what Charlie gets when Wishbone becomes part of her life. With that said, it brought me great delight when Charlie realized that unconditional love can also come in many different packages. As I reflect on some of the horrific things that have happened this past weekend, I find that reading Wish came at a good time for me. I think about how Charlie stereotyped the people of Colby, North Carolina, as hillbillies until she got to know them personally, spending a great deal of time with them. How time and effort can shift a perspective. How I wish more people could take the time and effort to understand those "different" from them. But mostly, I love the simplicity of this book. 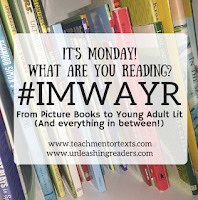 While I'm sure it wasn't at all simple to write, reading it was like dangling my feet in a cool mountain stream or sitting on my screened porch - effortless and delightful. I loved this review. Makes me want to try harder to share this sort of detail when I talk about books I've read. Now I'm even more excited to read it! It's in my bag for the first bus to Boston. I will have to read this one to my 4th grade class next year! Thank you for the detailed review! Fabulous review. And every word the truth! Also love WISH. I will come back to read after reading Wish, Karen. So many are so excited about this one! I really want to read this too! Can't wait to get hold of a copy! Like someone before has said, I loved reading this review. Barbara Oconnor can capture the essence of a story and spin it out like magic. You do a pretty good job too. If this book wasn't on my list already, it would be now.